Obviously. Petra is the site of the iconic ancient rock carvings of the Nabatean people, an originally nomadic tribe who inhabited the Northern Arabic peninsula and surrounding area from 4th century BC until their conquest by the Roman Empire in 106AD. Petra was the center for trade and agriculture of the Nabatean people, even after they were annexed by Rome, but following a devastating earthquake in 363AD, and the increasing decline of the overland trade routes in the region, the site was eventually abandoned, and remained virtually empty until 1812, when it was rediscovered by Johann Ludwig Burckhardt, a Swiss adventurer and geographer. It was declared a UNESCO World Heritage Site in 1985, and is Jordan’s most visited tourist attraction, with hundreds of thousands of international visitors each year. I’d visited Petra when I travelled through the Middle East in 2012, but I was excited to come back with my family, as it was such a unique experience. When you enter the site, you walk down through a narrow canyon, with twisting stone walls. I strongly recommend arriving when the gates open (6am) if possible, as this experience is so much better when you are not being jostled by crowds. After walking for a kilometer or two, you turn a corner and suddenly you’re standing before the massive facade of the Treasury: the first, and most famous, carved building of the city. Competition for prime photo real estate here is fierce, and you will be accosted by locals offering to take you to a better photo location “for ten dinar”. This is not necessary, as you can view the Treasury from above if you take the Al Khubtha trail (turn right at the toilets after the theatre), which I highly recommend. Dad and I also chose to do the grueling walk up to the Monastery (850 steps, thank you very much - continue up the trail to the right after the restaurant) and see the view of the surrounding Arabia desert. We also bought some beautiful jewelry from a stall near the top, whose proceeds went to a local woman’s group. Animals: Camels and donkeys and horses, oh my! There are many different four legged animals available to give you a ride if your legs get tired (like mine did), for a small fee. You can, and should, report any animal mistreatment you witness to the authorities. Be aware that the riders do not always slow down or make any effort to avoid pedestrians - it’s best to keep an eye out for them and get out of their way…and mind the poop! Shops and food: Everywhere you go, stall owners invite you in for some “Bedouin hospitality” - which consists of delicious tea or Arabic coffee in their tents, and free “browsing” of their shop. There are many beautiful trinkets and handicrafts for sale in the stalls throughout Petra, manned by the local Bedouins. Haggling is a must! However, do respect that this is their livelihood, and pay a reasonable price for their merchandise. I would have thought that “you break it, you buy it” went without saying the world over, but in Petra, I witnessed a tourist smash a couple of small items by accident and then walk away, refusing to pay, which I thought was really unforgivable. Clothing: keep in mind that Jordan is a fairly conservative country, and if you tend towards the female persuasion, you should dress accordingly (cover your shoulders, midriff and knees - this will also help you avoid sunburn)! 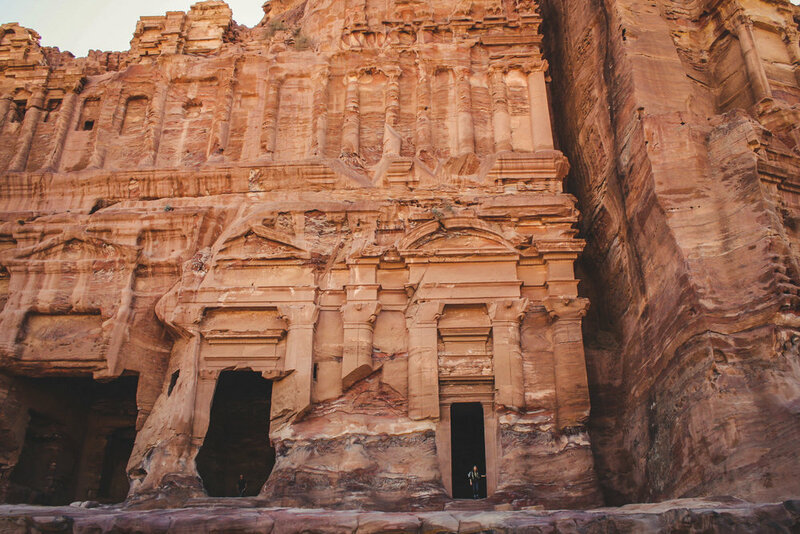 Petra is definitely a hiking activity - the pathways are rocky and uneven, and sandy in some places, so wear comfortable, sturdy shoes. On the other hand, what do I know? We saw more than a few people who were dressed up for their photo opportunities (gotta get that love on the ‘gram) and they seemed to be doing fine in their mini skirts and sketchers. Last time I was in Jordan, I didn’t make it to Wadi Rum. A girl I met in a hostel had had a bad experience desert camping and it had turned me off the idea. However, I’m SO glad we went this time. Wadi Rum is difficult to comprehend unless you’re in it. It’s other name is “Valley of the Moon”, and it really does feel like you’re on another planet (in fact, it has been used as the set for several space films - including “Rogue One” and “The Martian”). We organized a half day trip with a taxi driver from Aqaba, who put us in touch with his local friends. They took us on an awesome jeep tour, and supplied us with a fantastic dinner in one of the Bedouin camps, before we headed back to town. There are, however, hundreds of options for seeing the Wadi. You can do a day trip or half day trip like we did, with a taxi driver or with a proper tour company. 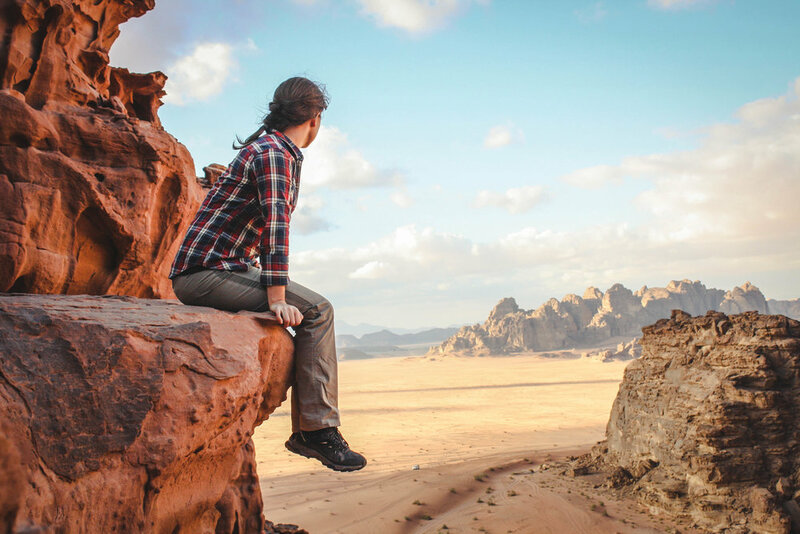 You can arrange to stay overnight in one of the many local camps; go on a guided walk, hike, rock climb, camel or horse ride, or even take a hot air balloon. However you do it, make sure you see Wadi Rum! Originally, we were planning on trying to dive in Saudi - maybe from Jeddah, or further South (or in the North? )… but the logistics proved too difficult, so Aqaba was really the main reason we came to Jordan. I’d dived the Red Sea in Eilat, and had been impressed with the variety of corals and fish. The diving from Jordan was similar, a beautiful experience, with a rich array of tropical fish, coral gardens, and, bizarrely, a US army tank and carrier plane, which were sunk off the coast for tourism purposes (rather than in battle). The water temperature and visibility were perfect, and it remains one of my favorite dive experiences in the world. We dived with Sinbad Tours - a company based in the Berenice Beach Resort, a ten minute drive south of Aqaba city, and found them to be fantastic. Aqaba itself was basic, with none of the tourist trappings of neighboring Eilat. Most establishments (with the exception of the hotels) do not serve alcohol, and there isn’t really much in the way of night life. However, we ate some delicious meals at a (fairly touristy) restaurant on Al Saada street (the name of which we completely failed to memorize), and enjoyed strong, sweet street coffee on those early morning starts to Wadi Rum and the airport. The Dead Sea is one of the first health resorts in the world - used by King Herod - and to this day it draws tourists from around the world, both for the health benefits of its mineral rich water; and also because its really freaking cool how you can basically float on top of the water. From the Israel side, there are several free public access beaches to the sea, but from the Jordanian side, most of the beaches are owned and operated by the resorts and hotels, and you need to pay a fee to enter. The Kempinski is the only resort without a day pass, and the Dead Sea Spa had the cheapest day pass that we could find (20 dinar for the day) - but you had to pay for a towel and there weren’t any proper indoor shower facilities. We considered staying the night, but I’m glad we didn’t - unless you’re interested in splurging big-time on some of the world-class spa facilities and treatments, you will most likely find that after floating in the water for a while (until the giggles wear off); smothering yourself with the viscous, black mud (it was free at the Dead Sea Spa beach - I highly recommend wearing an old or dark-colored swim suit); and then soaking it off and showering… you’re probably ready to go. The drinks at the pool were eye-wateringly expensive, and there were a LOT of flies at that time of year, which made sunbathing kind of a bummer. The actual experience was still amazing, and we all went on and on about how FABULOUS our skin felt afterwards, as we drove back to Amman, for our final “must see” destination: the Roman Ruins. After getting checked in to our hotel, we decided to walk to the Roman Ampitheatre and the Citadel ruins in the center of town. Originally we had planned to take a day to drive out to Jerash, the ancient Roman city, but we ended up running out of time. So instead we negotiated the uneven sidewalks and terrifying traffic of rush-hour on a Thursday in Amman (Friday-Saturday is their weekend, the same as Saudi), and walked the hour or so down to the center of the city. I say “down”, because Amman is built in a kind of inverse cone, with the city center at the bottom, and mountains built up all around. We snacked on little, churro-like sweets and coffee from a street vendor, and scrambled up a set of stairs through what looked like someone’s backyard, following some mimed instructions from locals on their balcony, and all of a sudden, found ourselves standing amongst giant Roman pillars and stones, on top of a hill, overlooking the rest of the city, just as the sun was setting over the skyline. It was a magical experience! The ruins themselves were spectacular, and we had a wonderful, aerial view of the amphitheater, but the real pièce de résistance was the call to prayer. The calls were staggered, so that the sound sort of washed around you as you stood in the middle of the city. Each of the mosques have a tower from with prayer is called, and they light up with a green light, so that it gives the city a kind of eerie, science fiction feel. Day 5: get up SUPER early AGAIN to fly up to Amman, and get a taxi from the airport to the Dead Sea - then a taxi back to Amman, check into Marriott (again, see our article on points and rewards - and I highly recommend this place for its incredible dining options), walk to Roman Ruins. Packed day. Day 6: chill in hotel, watch movies, get massages…generally act like on vacation. Fly home! We would love to go back and explore the mountains in the north, and spend more time in Amman. Let us know about your Jordan experiences and must-sees! You shouldn’t drink the tap water in Jordan, and drinking fountains are rare, so quite often, bottled water is your only option. If you’re eco conscious, like us (or an eco warrior, like my Dad), this can be painful, but it’s super easy to dehydrate in this climate, so make sure you buy big bottles, or glass, wherever possible to reduce plastic waste. On a similar note, if diving or snorkeling, consider wearing dive gloves, and doing your bit to keep the ocean clean. The three of us must have picked up 2-3 kilos of plastic rubbish on our dives, just from the reef off the beaches. Do your bit to say “thank you” to your host country! UPDATE: the day we left, there was terrible flooding in the South of Jordan, which killed multiple people and left many homes destroyed. If you do visit the country, be mindful of your own safety when visiting remote areas - always take a guide and check the weather forecasts - and consider donating to help those affected by the floods.